I’m so lucky to have been sent Wanderer Fabric from April Rhodes! 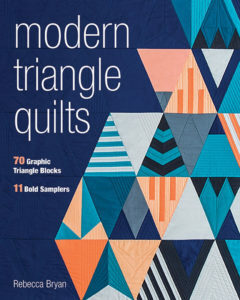 I met April at last Fall’s Quilt Market in Houston. But prior to meeting her, I became familiar with her work through her Staple Dress pattern. Of course I made a couple Staple Dresses, and plan on making another. But April also has a bunch of other totally adorable patterns I’d like to try too. Wanderer is her second fabric release; the first was Arizona. Her colors and aesthetic totally blow my mind. I’m a total fan so I tried to play it cool when I introduced myself to April at market. 🙂 But, she is so sweet and enthusiastic. It was lovely to meet her. 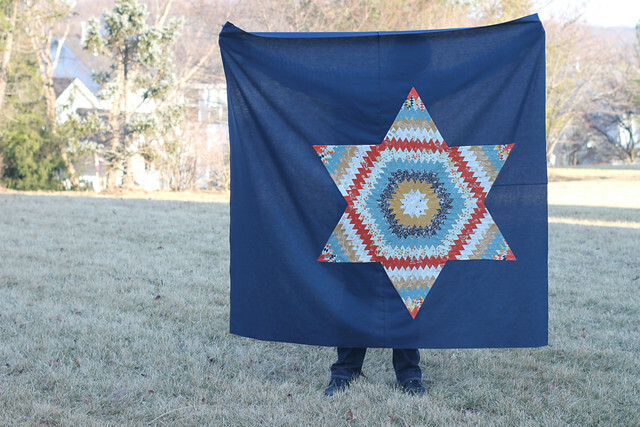 After tossing around some ideas with April, I decided that my Icarus Star quilt pattern would be a perfect quilt for Wanderer. 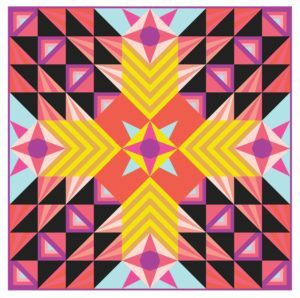 My Icarus Star is inspired by Kilim designs and Wanderer happens to have a killer Kilim print (the Serape Dream and Serape Fervor prints). The inspiration behind the name “Icarus Star” comes from story of Icarus. If you are familiar with the story … you will remember that Icarus’ his father made him wings from feathers and wax. In his delight, Icarus forgot his father’s warning about flying too close to the sun. His feathers melted apart and he fell…. As you may see from the pictures, the Icarus Star is imperfect and a bit lopsided. I never want to (nor am I able to) forget my imperfections and my limitations. I don’t want to come off as perfect or having it all together. It’s laughable to think it’s possible for me to come across as having it all together; if it is, I’m sorry, it’s not true! I know that God can make something beautiful despite, or even through, my brokenness. And for me, the Icarus Star embodies that desire. One thing I want to talk about is choosing the background fabric. 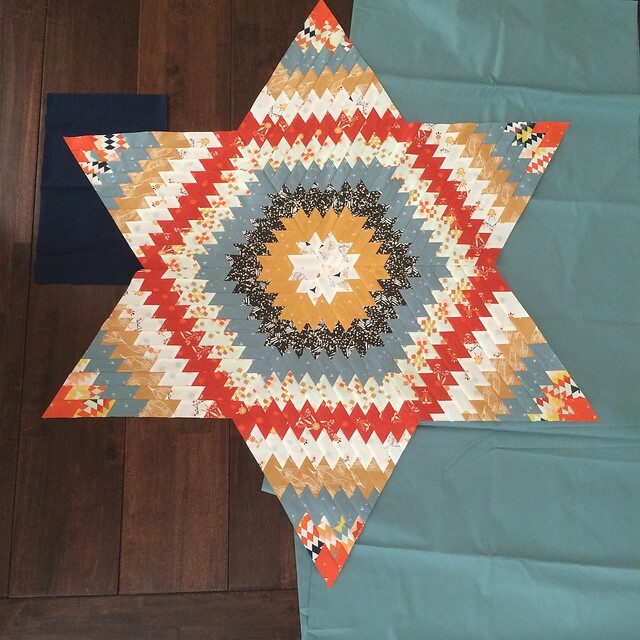 If you decide to make the Icarus Star pattern for yourself, hold off on choosing the background fabric until you have the star constructed. Personally, I had such a difficult time deciding on the background fabric in the original version and the wanderer version. This time around, I thought I had a background color nailed down and the lovely people at Art Gallery Fabric sent me the fabric I needed. BUT! 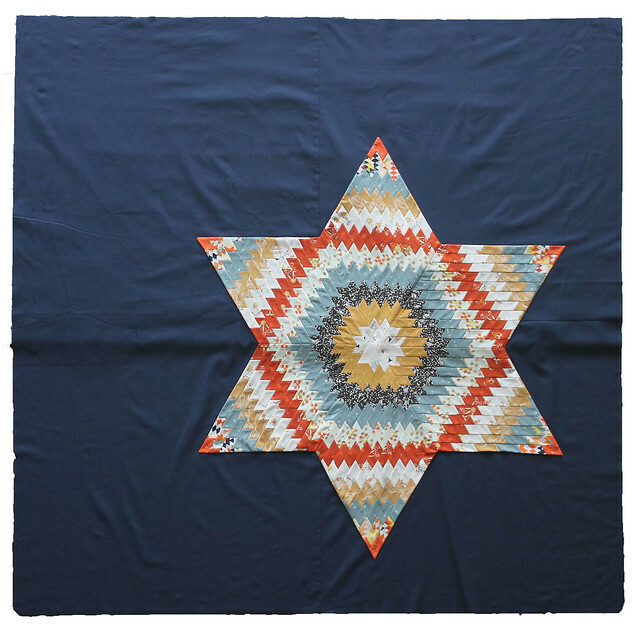 Once I got the star made and laid it out on the background fabric, I knew the green wasn’t quite right. So I scrambled to find an alternate. The navy turned out to be perfect. Here’s a picture showing the original green fabric, the navy fabric, and the brown I was considering. So that’s my Wanderer project. 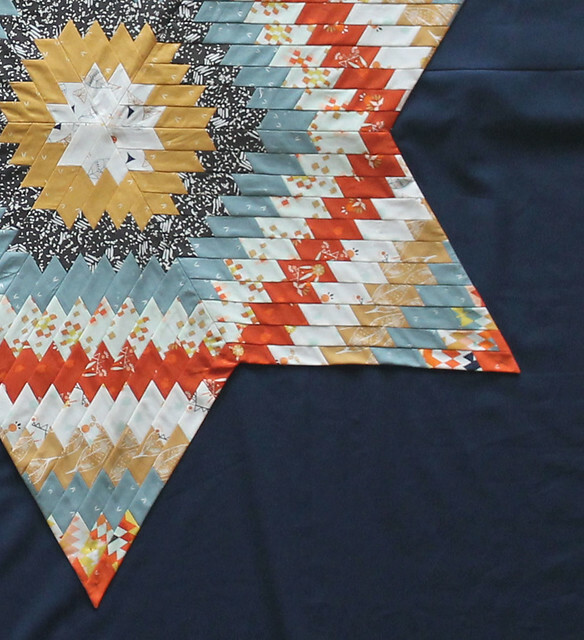 Be sure to check out April’s blog for details about her AMAZING giveaway (read: 20 half yard cuts of Wanderer!). 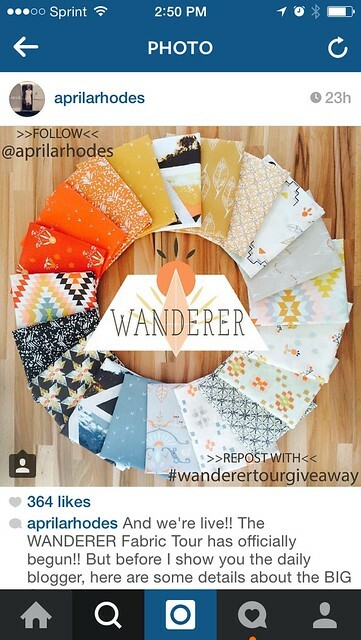 It’s an instagram giveaway so be sure to check out April’s feed (@aprilarhodes) and #wanderertourgiveaway. And also, be sure to check out the other fantastic projects! Really stunning and imperfections are definitely part of it's beauty. Love it! Oh, I love it so much!! 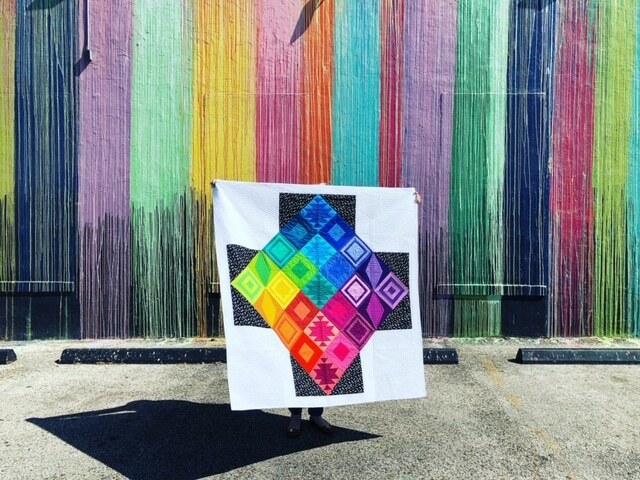 I've only made one quilt so far, and it was a very simple pattern, so this TOTALLY blows my mind! So, so beautiful!! …I mean wow. I didn't even notice the imperfections. 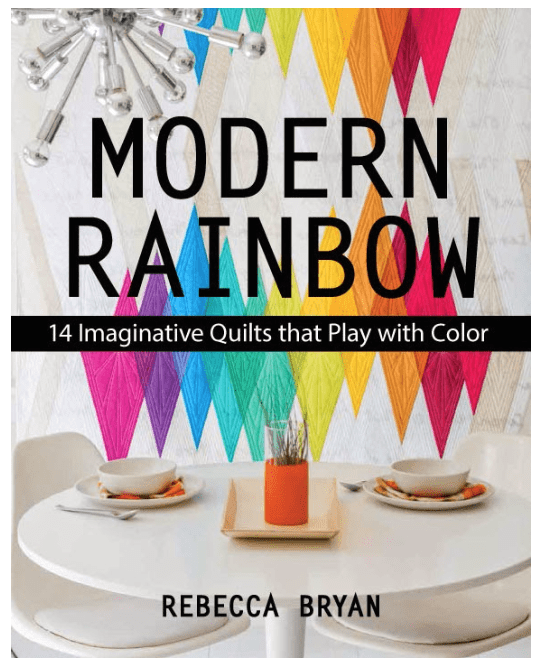 A totally cool project, Rebecca. Go read up on Gwen Marston – she doesn't believe there are imperfections. I invite you to share your progress at WIPs Be Gone – I see this finish very soon. Thanks for sharing! Wow this is beautiful! The navy background is just right! Rebecca it's truly stunning !! I'm drooling over the Wanderer collection and your talent.